Open-air festivals are subject to one huge influence entirely beyond their control: the weather. Fortunately, the sun shone on Dancing City, the annual dance-based afternoon of the Greenwich and Docklands international festival, bringing crowds out from the shopping malls of Canary Wharf and into contact with the performances scattered across its quaysides and plazas. There, stewards were easily visible, and offered guided routes between performances. Context is not, of course, everything: the performances themselves must attract and hold the attention of a passing and often distracted audience. Catalan company Cia Moveo did this very effectively with Conseqüències, a mix of impactful physical theatre (throws and launches, plummeting dives, splat-landings), legible but dynamic compositions, and sly theatrical misdirection, with performers planted in the audience. Though accessible, it didn’t patronise: the feats were underpinned by clear physical ideas – the reflexes of action and reaction, the way that momentum ricochets through a group – and the piece seemed to tap the erratic energies of city life itself. 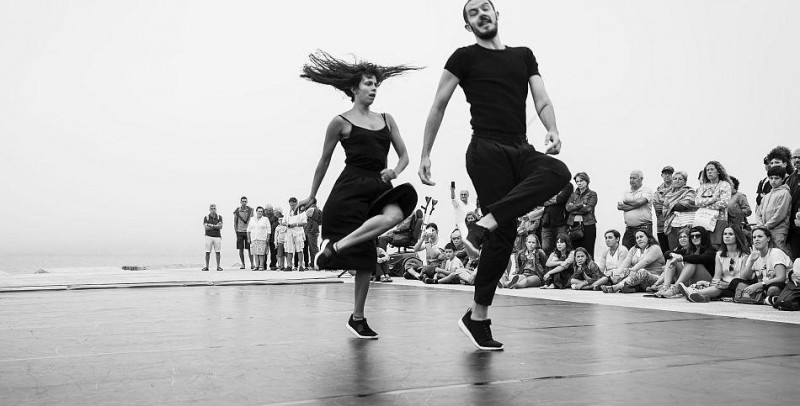 Best known for Smashed, their apple-juggling homage to the sprawling dance theatre of Pina Bausch, Gandini Juggling switched to a quieter register in Gibbon, a contained, deadpan duet for two men, albeit in Bauschian bare feet and black suits. By undercutting rather than fulfilling expectations – juggling with a single ball, choreographing mistakes, creating false beginnings and endings – Chris Patfield and José Triguero made space for a seriously interesting and wryly amusing fusion of juggling technique, physical theatre and careful dance phrasing. There were imaginary balls in Joe Garbett’s Doubles, a gameful mashup of dance and table tennis. The mixed-doubles partners larked around and across a ping-pong table, leapt over and bounced past each other, paddles in hand. It was entertaining enough, but fell short of the physical exactitude of a real match: the irregular staccato of rallies, the swerves and spins, the attack and counterattack. Also a little safe was Dedicated to …, a tribute to female friendship by Caroline Bowditch for Candoco dance company. Starting and finishing with Welly O’Brien and Victoria Fox on separate benches, the piece tracked their encounter through sideways slips, hook-legged pushes and shifting supports. Bathed in sunlight and pleasant music, it felt more nice than convincing. Nomadis by Humanhood (Rudi Cole and Júlia Robert Parés) was a far fiercer piece. Performed low to the ground – and so more suited to its indoor location inside a multilevel shopping arcade, where people could see it from above – theirs was an encounter forged from serpentine coilings and martial-arts attitude. Rather than counter the popular cliche of contemporary dance as “rolling around on the floor”, they made it credible by being so damn good at it. Originally made for indoors, Jesús Rubio Gamo’s Bolero transferred very well to the open air. Like Ravel’s well-known score, to which it is set, the piece is built on the relentless repetition of a singular idea. Yoked together and trotting in circles and diagonals, Clara Pampyn and Alberto Alonso began with the brisk efficiency of show ponies doing laps and runs. As the music intensified, they increasingly betrayed signs of exhaustion and desperate determination to keep going. Like contemporary-dance counterparts to Jane Fonda and Michael Sarrazin in They Shoot Horses, Don’t They?, Pampyn and Alonso simultaneously delivered the show and showed up the gladiatorial cruelty of our spectatorship – and we loved it.